By now, you should have found a theme to use on your OpenCart site. If you have not yet found a theme, please read our article on finding an OpenCart Theme. Once you have downloaded the theme, you can begin to install it. Not all themes can be installed using the same steps. This is the most common method of installing a new theme. However, most themes have a read_me.txt or install.txt file with installation instructions in it. Please read your themes installation instructions before attempting to install a new theme. In this article, we cover the basics on installing an OpenCart 1.5 theme. Make sure you have downloaded the Zip file containing the theme to your local computer. Login to your OpenCart website using FTP. Please read our article if you need help using FTP. 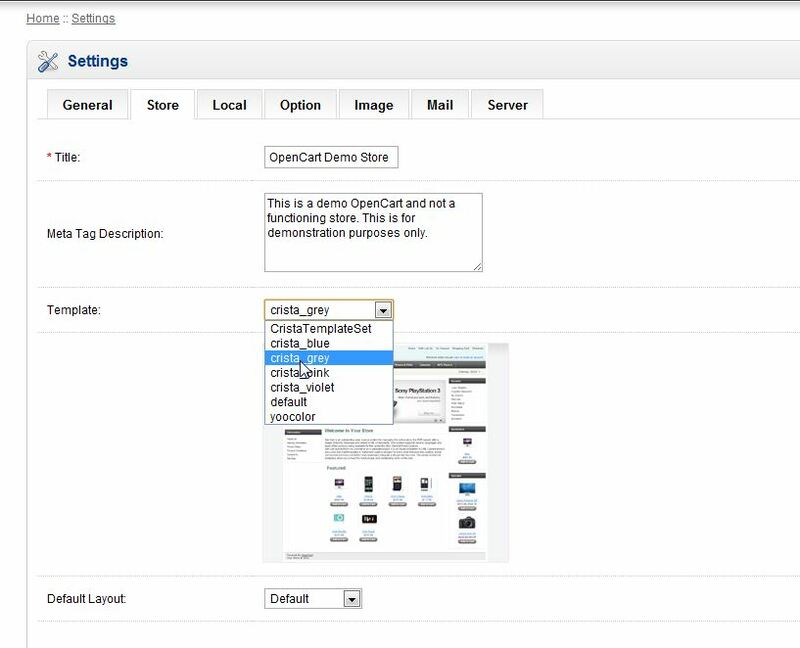 Upload the catalog and images folders to the root of your OpenCart installation. Go to the Store Tab and choose the template you just uploaded from the drop down menu under the template section. Congratulations! You have successfully changed the theme of your OpenCart shopping cart. If you need further assistance please feel free to contact support department. How Do I Bring my Buttons Back to Normal? Hello i am unable to add theme in opencart 2.3. please povide me the screenshots. Thank you for contacting us. We have guides on Installing OpenCart 2 with Softaculous, and Installing OpenCart 1.5 Manually. Also, here is a helpful link to the official OpenCart Installation guide. It includes steps and screenshots. Recently downloaded the hairstyle theme from themeforest, trying to upload it to opencart and am having trouble finding the exact place in the FTP where to put it. I was wondering if you could possibly point me in a direction for uploading that theme to opencart. Typically, you would upload the catalog and images folders to the root of your OpenCart installation. Here is a helpful link to our guide on How to find the Document Root for your website. Your theme should include a detailed installation guide as well. I am changinging default theme but not in template part dropdown. How can apply theme. I m using freashmarket theme. Hello team, I installed a new theme to my opencart 2.0. I have followed all their documentation settings for modules, banners and layout but I still can't see them display on my website. The homepage slideshow is working fine but I can't have the other things showing. Pls where am I going wrong? Thank you for contacting us. What theme did you install? Can you provide a link to the site, so we can help you test further? I don't see the catalog folder but i see image folder in my theme folder so what should i do now?after selecting the files of theme where these should be place in our website Install folder? or direct in root folder? Thank you for contacting us. You should upload the folders to the root of your OpenCart installation. This will differ based on your setup. Here is a link to our helpful guide on how to find the Document Root of your website. Also, I recommend reviewing the installation documentaion that should have been included with the theme you are installing. i have uploaded pavilion them that i have download from another website C panel and upload it to my current website C panel but it is not showing on my open cart ... how can i suppose to sort out this? Did you extract the theme after uploading? I'm not sure how we can help you with the information you have provided. Do you have a URL so we can see the errors you are getting? After saving the theme, the store looks like http://supravat.org/ocart2/index.php?route=common/home, while my theme should look like http://eclipsehome2emerald.magikcommerce.com/. Please help me. I'm sorry for the problems with the OpenCart theme that you're using. If you're using a paid theme, you're best bet will be to look for the documentation and any support that the theme author can provide in loading the theme. We generally do not have access to these themes as they are third party and do not have access to the files or documentation needed to troubleshoot their installation. In briefly looking at site, it does appear that you're missing either steps or some elements for the proper theme install. Apologies that I can not provide a direct answer for the issue. If you have any further questions or comments, please let us know. Is this a theme? If so, are you getting this error when installing the theme? What version of WordPress are you using? Is the theme compatible with that version? Is it a free theme or a paid theme? actually first of all, we have to choose theme of same version and then we have to extract theme into view/theme folder and then choose from admin site. That is one way of doing it, yes. However the article above should still be relevant to installing an opencart theme. but i have confusion about this point.
" again we have to upload catalog and images of theme? That step is actually step 4. If you didn't already have the files in your OpenCart Installation, then you would need to upload the files into the proper place. The "files" would be the elements of the theme which are typically within the ZIP file. Always read the installation guide for the theme that you're installing for that information. I hope that helps explain the step. If you have any further questions or comments, please let us know. how to make this theme rtl . I'm sorry Nasser, could you please explain what you are asking in a bit more detail? i made changes changes accordingly as mention in the above article but after making thos chnages and selecting the theme and saved it. but when i run the website its all blank (empty white screen). Does the white screen only occur when using that theme? Have you enabled error reporting so you can see what error OpenCart is throwing? Is it possible without any ftp client? If it is how?? You can use the file manager as well as it is a web ftp client. Thank you for your question. Since this is a commercial theme, they should provide some level of support. I was able to find the Support page for the "Pav Fashion" theme here. Since they coded/created the theme they may be familiar with this issue, or have a workaround. We are happy to help troubleshoot further, but will need some additional information. What version of OpenCart are you running? What 3rd party addons/plugins are you using? Are you able to install other themes? Have you made any custome changes to the site, or coding? Thanks for the prompt reply, John-Paul! I'm using opancart 2.0. This may or may not be an issue... It's been a bit confusing. When I first bought the theme, I was told that running it on 1.5.6.1 would be better but, when I went to the tutorial, on their site, I was told to run 2.0. I haven't added any extensions or plugins at this time. I haven't tried installing another theme but will attempt to do so right now. And no. I haven't touched a thing yet. Please inform us of your progress when you installed another theme. Thanks for making such a great free template "stardomtheme". Now i have copied extracted file stardomtheme in "....upload/catalog/view/theme folder, and i have changed default to stardomtheme in "Store setting" in Opencart 2.0.1.1. Even after trying many times and saved, i could find any themes changing. Please help on this, It will be very much appreciate if you guide and successfully install your themes in my open cart 2.0.1.1. Thanks in advance and looking from your revert with a solution for this. Thank you for contacting us. We are not associated with "stardomtheme" in any way, but we can try and help you troubleshoot the issue. Have you tried to contact the Theme Developer? Did the Theme include installation instructions? Their setup may be different from the guide above. Can you provide a link to the theme you are installing? Sorry for the problems with the theme. We're not quite sure what you mean. Were you able to successfully load the theme? Did you have any errors? If you can provide us more information on the issue we can try to help. We would need know the exact name of the theme, if it was purchased, the version of OpenCart, and any steps to reproduce the problem. A URL for the website would also help if you don't us looking at the website. Please provide us this information if you require further assistance. Thanks for the question about changing the theme in OpenCart. The method is the same in OpenCart 1.5x or 2.x versions. Login to the Administrator Dashboard>Click on System>Settings>Store, then scroll down and select a theme that you have installed. You can find a theme through OpenCart and then use this article to install the theme if you have not done so before. i have download opencart and theme and both are same version . in theme the folder name admin and catalog all file copy in the same way of the opencart . when i am going to login in the admin panel and inter username and password but admin panel is not open. I am not quite sure what you are asking. Are you having problems logging into the admin of your OpenCart? Have you tried the password recovery?